With a faster processor and sharper screen, the second-generation Nexus 7 gives you a lot of bang for your buck. 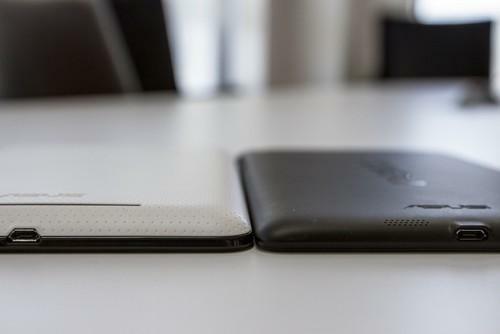 First generation Nexus 7 (left) with the new Nexus 7 (right). It looks like Google is finally starting to take Android tablets more seriously. I took Google's second-generation Nexus 7 out for a spin and found it to be superior to its predecessor in nearly every way: The tablet has a better screen, better guts, and better software than the Nexus 7 that shipped last year. The only thing it doesn't do better than the original Nexus 7 is coddle your wallet. This new model costs $US30 more (starting at $US229 for a 16GB Wi-Fi model) but that extra $US30 buy you a much better overall Android tablet experience. The second-generation Nexus 7 is both thinner and lighter than the original, making it even more comfortable to use and to hold one-handed. The material on the back of the device isn't as easy to grip as what's covering the original Nexus 7, and it felt like the new tablet was going to slip right out of my hands if I relaxed my grip too much. It feels solid and well-built, and didn't creak and groan when I tried to twist and bend it. The drop test will have to wait a bit; we don't want to risk breaking this thing right after taking it out of the box. The top and bottom bezels surrounding the screen are thicker than they were on the first Nexus 7, but the bezels on the sides have been slimmed down some to make up for it. While the original Nexus 7 had the front-facing camera sitting squarely in the top-middle of the device when you held it in portrait mode, it is offset slightly on the new model, so you don't cover it up as often when video-chatting with the tablet in landscape mode. The power button, volume controls , and charging ports are all in the same locations as before, but the headphone jack now sits on the top right of the tablet instead of at the bottom. On the back of this new Nexus 7 you'll find dual speakers with virtual surround-sound (one at the top of the device, and one at the bottom), as well as a 5-megapixel camera. The speakers on the new Nexus 7 sounded crisp and clear in my limited tests, but I was underwhelmed with the camera's image quality. It seems like it'll work great in a pinch in areas where you have good lighting, but my quick test shots taken indoors came out grainy and had a bluish cast to them. This new Nexus 7 has a sharper display (1920 x 1200) than the original (1280 x 800), making it great for reading ebooks or watching HD movies. Google ditched the NVIDIA Tegra 3 that was in last year's model and opted to instead go with Qualcomm's quad-core Snapdragon S4 Pro processor to power its new tablet. Games didn't seem to take as long to load on the new Nexus 7 as they did on the old one, and the tablet felt very responsive as I played a few minutes of Riptide GP2. The second-generation Nexus 7 will be the first device to ship running Android 4.3 Jelly Bean. It doesn't feel much different from Android 4.2.2 Jelly Bean, but you now you have the option to create restricted accounts that have limited access to apps and content--perfect if you have a kid who likes to steal your tablet to play Kingdom Rush and you don't want them messing with your other apps. I did encounter a few bugs while poking around the OS: The email app randomly crashed even though I never opened it, and the tablet lagged a bit when I tried creating a second user account. Overall, it looks like Google has got itself a winner. The new hardware might not be enough to make owners of the previous Nexus 7 want to update, but the low price will definitely sway a number of first-time tablet buyers into picking one up. Google still needs to beef up its efforts when it comes to getting more tablet-optimized apps onto the Play Store, but for now, I'm just happy that the company hasn't abandoned the idea of running Android on something other than smartphones.